This little beauty has somehow gotten away with slipping under my radar for a few days, but don’t worry, there’s still plenty of time to get involved. The people at Chapter One Gallery and Carnaby London have got together to put on an amazing fashion market in Kingly Court, selling products from a huge range of brands from around the globe. Running all the way up until Christmas, you’ll be able to buy from a whole bunch of big names in the streetwear game including Mighty Healthy, Diamond Supply Co., Supra, KR3W, The Hundreds, Rebel 8, Rogue Status, HUF and loads more. For any streetwear head this seems like the ideal place to be, with such a massive selection of brands all in one place. I’m a little worried about going because I know I’m wont be able to leave without dropping some serious cash! UK brand Second Son have just become part of the market too, giving you even more reason to head down. 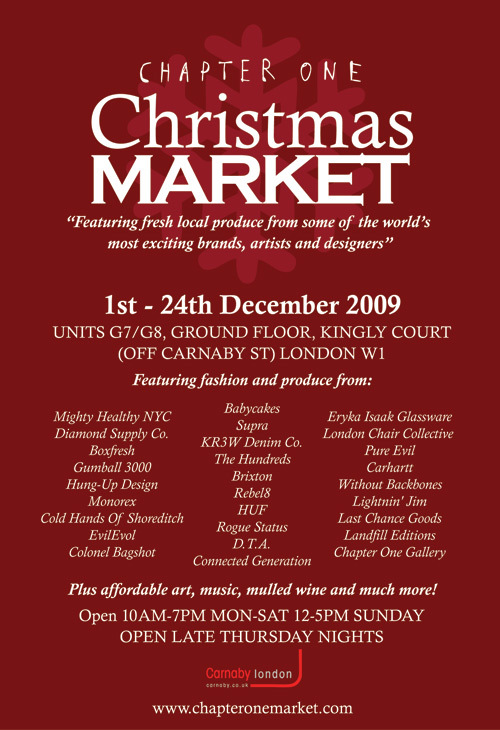 With a bunch of other independent UK brands, art, music and even some mulled wine, this market seems ideal for a little bit of Christmas shopping. For more info check out the Chapter One Market site.